What child doesn’t love a slipcase full of books? In my house these items are gold on the shelf, indicating much-loved and well-read volumes for returning to over and again. Roald Dahl, Enid Blyton – childhood staples that always deliver. 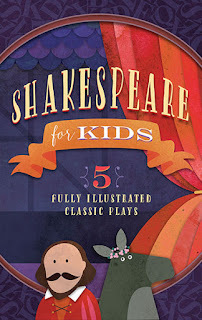 So I have to say that the mere notion of a slipcase full of Shakespeare for kids had me a little concerned. Can the concepts within Shakespearian plays, created for mass public consumption within a very specific time and context, really and truly resonate with today’s children? And the biggie; do these books warrant a slipcase? These volumes look the part, in a modern kind of way. In my collection (the first of four Shakespeare Classic Libraries) are The Tragedy of Macbeth, A Midsummer Night’s Dream, the Tempest, All’s Well That Ends Well and Much Ado About Nothing. Muted colours on the box and covers give each a certain gravitas which does seem important when introducing the bard. The interior of the books is cohesive and lives up to the promise of illustrations on each page. Black line drawings take us through the same introduction of Shakespeare in every book (one page with an illustration in a hand-drawn frame, a nice touch), and then to an illustrated list of the main characters in each play. There are two obviously different illustration styles in the collection of books I received. I, personally, am very fond of scrawly line drawings (Quentin Blake is an all-time fave) and appreciated both styles which have come from McCaw books. To their credit, these books are exactly what they say they are: straight up, no frills, blow-by-blow outlines of Shakespeare’s plays. Not written as plays but rather as condensed summary texts, they make sense of often grossly convoluted plots in a comprehensive manner. Interspersed with dialogue and illustrations, each is compact enough to engage and hold attention, and is accessible to children in terms of language and ideas. So far, so good. As a reviewer I do have to note, however, that these are not the gorgeous, Roald Dahl-esque sublimely clever and rhythmic treatments of the classics that I was secretly hoping for; for instance, there’s no modern equivalent of the iambic pentameter that so endeared Shakespeare to his audiences. However, when all’s said and done I believe that they do make a substantial offering and for that, they earn their slipcase – a very different kind of slipcase to those that contain imaginative, much-loved children’s classics - but one that’s library-worthy nonetheless.